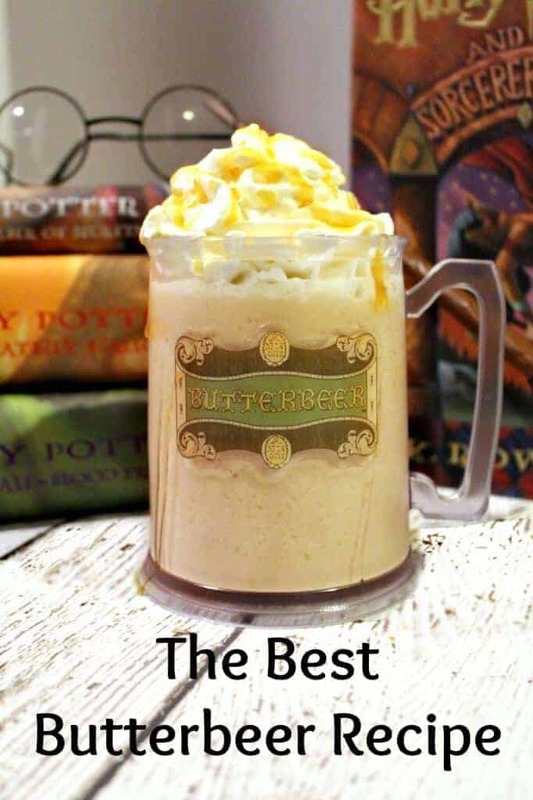 Copycat Butterbeer Recipe - The Very Best Frozen Butterbeer Recipe Ever! Harry Potter would be super impressed with the Best Butterbeer Recipe Ever! 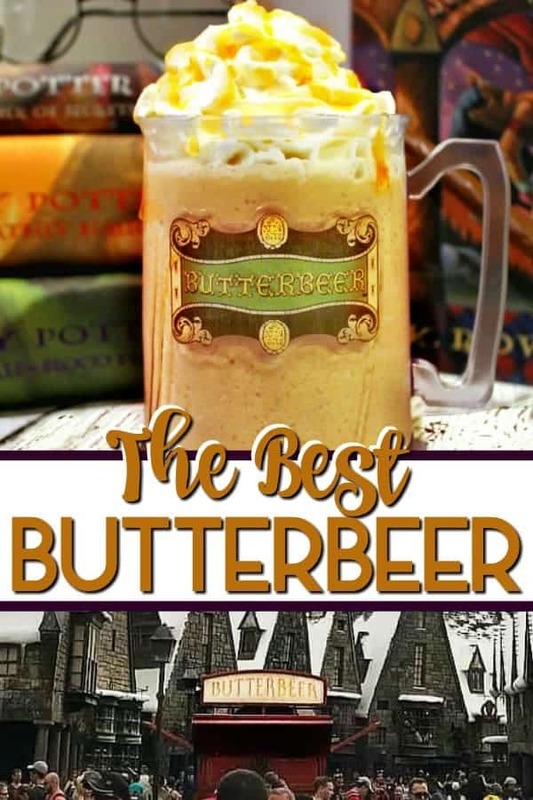 You can make it from home and get that same great taste as the Frozen Butterbeer from Universal Studios Wizarding World of Harry Potter and it is easy to make! The Best FROZEN Butterbeer Recipe EVER! 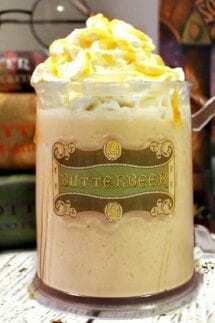 Do you love the Butter Beer from Harry Potter World at Universal? Then you MUST try this copycat version NOW! We tried all of the versions of Butterbeer from the Wizarding World of Harry Potter we were obsessed! There is the regular version with its delicious foamy topping, the hot version which is perfect for a cold winter day, but our favorite version was the frozen butterbeer. It was beyond amazing. 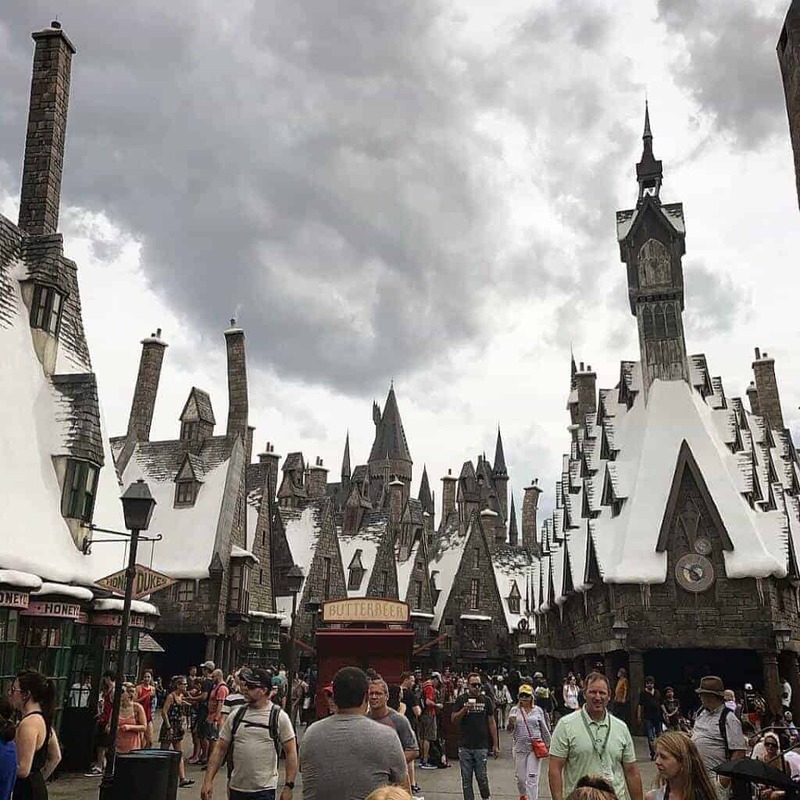 Walking around the Wizarding World of Harry Potter at Universal Orlando and Islands of Adventure, you feel like you just stepped into the Harry Potter book series! All of the shops and restaurants are just like you would imagine them. We loved walking through Hogwarts and Gringott’s and trying out our magical wands in special places around the parks! Planning a trip to Universal Orlando? Then be sure to check out my Tips for Visiting Universal Orlando and Tips for Visiting Universal Orlando During the Holidays! When we were wandering the streets of Hogsmeade, we saw people lining up at a cart. What were they waiting for? The famous Butterbeer! Of course, if all of these people were trying it, we didn’t want to miss out. So, we thought we would give it a try and boy were we glad we did! It was seriously a crazy good delicious drink! Of course, the first thing I had to do was try to recreate this delicious treat and learn how to make frozen butterbeer! Well…after 3 years and lots of trials and errors (but it was tasty trying all those errors) we nailed it! I am telling you this is THE BEST butterbeer recipe ever! I have been back to Universal Orlando and compared them….this is the closest we have tasted. This one is for the frozen butterbeer version, looking for the hot butterbeer version, we have that too! Soon to come….the adult only version!! 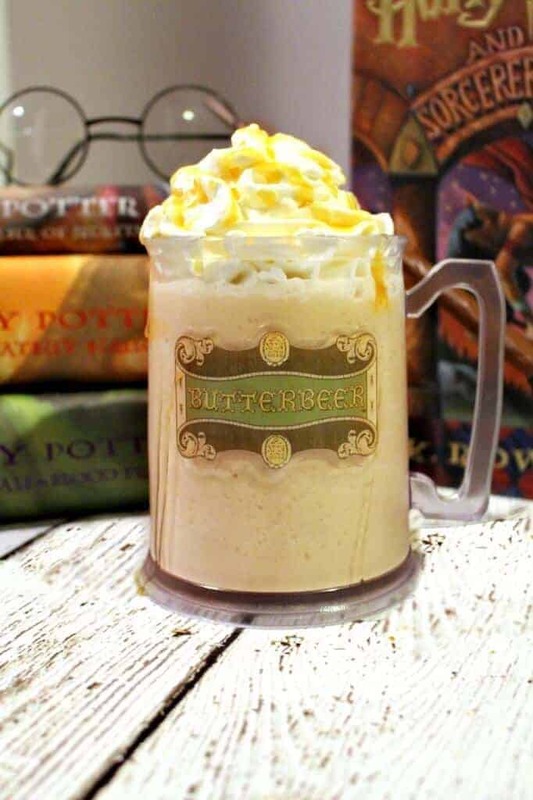 There are tons of recipes out there to make Butterbeer, but none are as easy as this one! Grab your chocolate frogs and getting ready for a special treat! The only thing you really need to do to prep is freezing your cream soda into ice cubes for a few hours before you are ready to make this. Just pour a cup of cream soda into your ice cube trays and freeze until frozen (about 3-4 hours). Then, we took about 2 cups of the cream soda ice cubes and Add in ice cream, imitation butter extract, rum extract, 1 cup of cream soda, butterscotch topping, salt and blend until smooth! Pour into your favorite mug (we like to use a frosted mug) top with whipped cream and drizzle with butterscotch topping and enjoy! Here are some answers to some common questions we get about our homemade butterbeer recipe! What is the Butterbeer at Universal Studios made of? No one really knows for sure, because Universal won’t release the official ingredients. However, our versions base is made from cream soda with some delicious add-ins to give it just the right flavor. Our version does not contain alcohol. In J.K. Rollings Harry Potter books, it is said that butterbeer contains the slightest bit of alcohol, but we decided to make it without any alcohol so the kids could enjoy it! How to make an alcoholic version of Butterbeer? While our version is totally alcohol-free, I wouldn’t be opposed to adding a little butterscotch schnapps or salted caramel vodka! Just add a little in and blend it up with the rest of the ingredients! Harry Potter would be super impressed with our Best Butterbeer Recipe Ever! You can make it from home and get that same great taste as the Frozen Butterbeer from Universal Studios and it is easy to make! 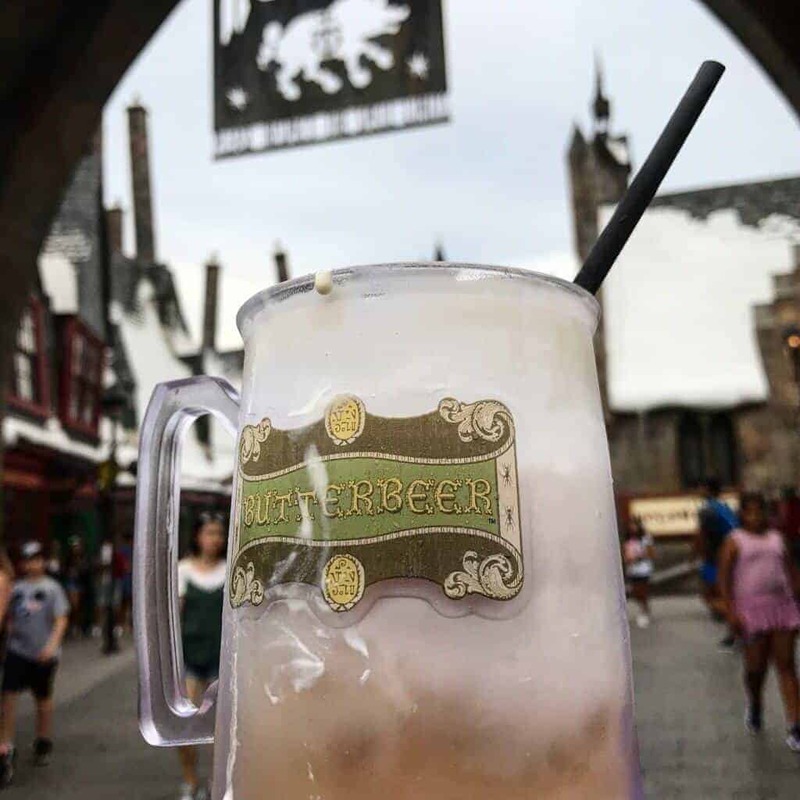 Do you have a recipe for a not frozen butter beer? Schwepps ‘traditional creamy soda’, Kirk’s Sno-Drop, Woodroofe’s Sno-Top, Golden Circle, etc — there’s a lot of them! Anything with a nice robust ‘butter vanilla’ flavor to it would work good. I’m Australian (born & bred, 35 years!!) & have been enjoying cream soda since I was a little kid??? Schweppes traditional cream soda would work best in this recipe (the brown cans) because of it’s rich vanilla taste. What are you talking about? Kirks makes creaming soda in australia. Its stocked in all coles and woolworths. When you say “butterscotch topping”, what do you mean? I believe its the butterscotch syrup you would put on a sundae (instead of caramel or fudge syrup). It should be sold next to ice cream toppings, schmuckers brand makes one; in the supermarket. Sounds delish, but can you please tell me what imitation butter extract is and where I might be able to find it? I’ve never heard of it. Thanks! OMG…every time I stumble onto something amazing on Pinterest; it was pinned by you. This looks amazing I will most definitely be making this in the summer. 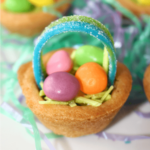 You are so sweet – glad you are liking the things I am pinning!! BOTH! Add it to the mix and drizzle at the end!! If I’m making butterbeers for 4 kiddos and at least one parent, should I double this? I’m not seeing a “Serves #” anywhere…. THANK YOU!!! Hi Michelle – I would for sure double it. Any good ideas for a cream soda in India ? The recipe is lovely and I just can’t wait to try it out ! Is cream soda the same as ice cream soda? No, use A&W cream soda. Cream soda is a sweet carbonated soft drink, often flavored with vanilla. I haven’t but am WAY overdue!! It is on my list! Thank you! Just made this for my kids before heading out to see Fantastic Beasts- delicious & easy and very close to the Universal Butterbeer. 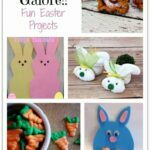 So fun – everyone loved it! how many does this serve???? It doesn’t have rum in it because if it did thin I wouldn’t have been able to get it and it was non frozen cream soda. I’m wondering if I can use real butter instead of the butter extract (perhaps a teaspoon or so, melted). Thoughts?